It was actually a little tense in Q3, at least for a little while. It was looking like Bottas had managed the trick against his teammate, particularly when one considered that the session had been stopped for 10 minutes or so after Smiley Ricciardo stuffed his car into the walls at Turn 6. The session was red flagged, which meant all the tire heat went away... and it's notoriously difficult for the Mercedes chassis to get them warm in the first place. Didn't matter. Hamilton pulled out a lap around Baku that will probably go down as one of the most impressive pole runs ever. He ended up with nearly a half-second advantage to his teammate in second, and over a full second to Kimi Raikkonen's Ferrari in third place. Insane. This pole also moves Hamilton to second place all-time in career poles with 66... one ahead of Ayrton Senna, and only two behind Slappy Schumacher. In other exciting news, the two McLaren boys have engine and gearbox change penalties totaling 70 spots between them. No, that's not a typo: seventy. Seven-Zero. Too many power units used, unscheduled engine change, yadda yadda. In effect, this means nothing but it points out the current stupidity involved in the penalty system. Also, you may have noticed there were only 19 cars listed. Missing was Jolyon Palmer and his Renault, which suffered an engine fire (and subsequent marshal bukkaking the entire thing with extinguisher foam... seriously, it was just silly) in P3 and could not be repaired in time for Quals. He races at the Stewards' whim tomorrow. Speaking of tomorrow, we'll see you after the race tomorrow! Post contains 486 words, total size 19 kb. 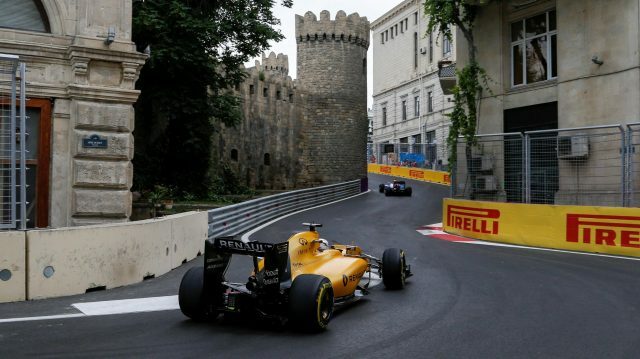 Sector two runs through Baku Oldtown, through ridiculously narrow streets and zipping past a friggin' castle (actually a curtain wall, but who's counting?). But see, here's the thing... as interesting as that can be, the whole rest of the track is a whole lot of nothing. The whole of Sector three, from Turn 16 to Turn 1, is essentially one long straight. Oh, sure, there's a little whoopsie at Turn 18, but last year the cars weren't slowing down for it. What do you think this year's chassis, with it's higher grip levels and wider tires, are going to do? And then there's Sector one. It's no breaking news that I'm not fond of 90° turns since they guarantee that any sort of flow that might arise is immediately mugged, stuffed in a canvas bag, and thrown into the ocean with weights attached. Look at the old circuits like Spa or Monza or Suzuka or Silverstone... they look like they were designed freehand, no drafting triangles or protractors allowed. In fact, the only right-angled turns on those circuits are new additions, generally a chicane to slow the cars down before a blast to the finish line (note: Monza is exactly the opposite, a chicane to slow the cars down after the front straight). Those places have a rhythm to them, rhythms that a good driver can meld into. Monaco is a special case, of course, as Monaco always has been. So Baku has a terrible reputation, even after just one race. Last year, the teams were cautious unto death, tiptoeing their way around the place like... um... I can't think of a good metaphor. This year, as mentioned earlier, wider tires and a wider car altogether is going to make the Oldtown section even more terrifying, probably. That's not a good thing. I would be interested in seeing how the place races in the wet, but as Baku averages 8mm of rainfall in the month of June, I'm not holding my breath. All times Pond Central, check your local listings if you don't trust me. With any luck, there will be something interesting to write about afterwards... or maybe I'll get to rant again, who knows? See ya then! 1 This is the one where we got to enjoy that somewhat-terrifying test-run video last year, yes? 2 A bit OT, I read yesterday that France is returning to the lineup next year, at Circuit Paul Ricard. Anyone know anything about the track, and have any thoughts about F1 returning there? 4 Bah, ignore the above. 5 Tiptoeing around like... The Scooby Gang? 6 Thomas, Circuit Paul Ricard was for many years a testing location for F1 in the offseason. There was a very good reason for this: it could be modified to just about any configuration you wanted. If I had to say what existing F1 track it reminded me of, I'd say Canada, but with a LOT more runoff area. But it will have been 28 years since F1 last raced there when the lights go out next year. It will essentially be a new circuit for everybody. 8 He really used every inch of the space between those ever-present sheer walls, didn't he? Yegods. 9 I still maintain that the 8-9-10 complex is a disaster waiting to happen. If someone screws up there (or the inevitable Honda engine fail happens there), they have to red flag (since there's no space for a car to pass). At that point, I have no idea how anyone between pit entrance and that turn complex returns to the pits. This is also discounting the fact that turn 8 is blind to any problems in the narrow corridor. Everything was just about perfect for the fast running of F1 cars today at Montreal: minimal wind, a bright sun bringing the track surface to temperature warm enough to melt the everpresent snow, and everywhere, constantly, the mingled smells of poutine, Tim Horton's, and Labatts. So what did this all total up to? Let's take a look at the provisional grid for the 2017 Grand Prix of Canada, eh? Q1 and Q2 were essentially uneventful. Everything played out exactly as you'd expect them to, and only the discovery that Pleasant Stroll is in real life a true-blue dyed in the wool Canadian. And he has a pet moose named Archimedes. That plays hockey. Defenseman. Moose. Whatever. Defensemoose. In Q3, though... we got what amounts to a declaration of war for the championship when Lewis Hamilton became the first ever to break the 1:11 barrier. A moment later, Seb Vettel brought his Ferrari across the line, fimishing a mere +.004 seconds behind. In-car footage showed that somewhere near the beginning of the lap, he had to jerk the steering wheel to catch a spin... it actually takes longer to read the description than it did for it to happen... and one little twitch was enough to cost him pole. Obviously we were gonna have a fun second run... and we did. Hamilton drove what could be called The Perfect Lap, lowering his track record even farther. Vettel had no answer and finished just under +.400 seconds behind. All of which suggests a dramatic race tomorrow... let's hoping! Post contains 413 words, total size 19 kb. You want fast? Canada can do fast; that back stretch from the Hairpin to the final chicane is as fast a run as you can find in F1. You want slow? That Hairpin I just mentioned is pretty darn slow, particularly as you're coming off a full-speed blast from the first chicane. You want marmots? Boy, does Montreal have marmots! And every now and again, you get a four-hour rain delay! You can't beat fun north of the border, you betcha. And here's the schedule for the Legendary Announce Team's broadcasts! Take a close look at the networks, we're all over the darn place this weekend! All times Pond Central. Accept no substitutes! Sometime afterwards of course there will be the usual F1Update!, so ask for it by name. 69kb generated in CPU 0.12, elapsed 0.2025 seconds. 45 queries taking 0.161 seconds, 242 records returned.